Jiun-Haw Lee received BSEE, MSEE and PhD degrees in electrical engineering in 1994, 1995 and 2000, respectively, all from National Taiwan University, Taipei, Taiwan. From 2000 to 2003 he was with the RiTdisplay Corporation as the director. In 2003 he joined the faculty of National Taiwan University in the Graduate Institute of Photonics an Optoelectronics and the Department of Electrical Engineering, where he is currently an associate professor. His research interests include organic light-emitting devices, display technologies and solid-state lighting. Dr Lee is a member of the IEEE, OSA, MRS and SPIE. He received the Exploration Research Award of Pan Wen Yuan Foundation and Lam research Award in both 2005 and 2006. He has published over 40 journal papers, 100 conference papers and 20 issued patents. David N. Liu has been the director of the Strategic Planning Division in the Display Technology center (DTC) of the Industrial Technology research Institute (ITRI) since 2006. He worked on IC and field emission displays at ERSO (Electronics Research and Service Organization/ITRI and Bellcore (Bell Communication research) from 1983 to 1996. He started his research and development work on plasma display panels at Acer Peripheral Inc. and and AUO from 1996 to 2002. After his service at AUO, he was in charge of the flat panel display technology division in ERSO/ITRI until 2006. Dr Liu received his PhD degree in electrical engineering from New Jersey Institute of Technology in 1992. He has over 45 issued patents, 18 published papers and a contributed chapter of the Semiconductor Manufacturing Handbook (McGraw-Hill, 2005). He also successfully developed field emission displays, plasma display panels and flat panel displays followed by the receipt of many awards from ITRI, Photonics Industry and technology Development Association, Administration Bureau of Science base Industry Park and the Ministry of Economic Affairs (MOEA). He was also a recipient of the Outstanding Project Leader Award from MOEA in 2006. Shin-Tson Wu is a PREP professor at the College of Optics and Photonics, University of central Florida (UCF). Prior to joining UCF in 2001, Dr Wu worked at Hughes Research Laboratories (Malibu, California) for 18 years. He received his PhD in physics from the University of Southern California (Los Angeles) and BS in physics from National Taiwan University (Taipei). Prof. Wu has co-authored four books: Fundamentals of Liquid Crystal Devices (Wiley, 2006), Introduction to Microdisplays (Wiley, 2006), Reflective Liquid Crystal Displays (Wiley, 2001) and Optics and nonlinear Optics of Liquid Crystals (World Scientific, 1993), six book chapters, over 300 journal publications and 75 issued and pending patents.Prof. Wu is a fellow of the IEEE, OSA, SID and SPIE. He is a recipient of the SPIE G.G. Stokes award, SID Jan Rajchman Prize, SID Special Recognition Award, SID Distinguished Paper Award, Hughes team achievement award, Hughes Research laboratories outstanding paper award, UCF Distinguished Researcher Award and UCF Research Incentive Award. 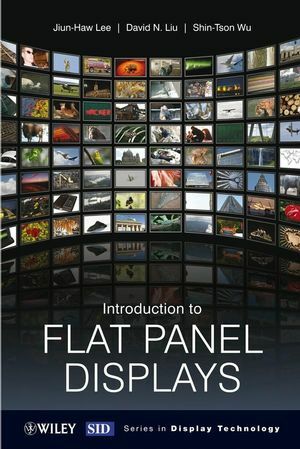 He was the founding editor-in-chief of the IEEE/OSA Journal of Display technology. 4.2. Transmissive thin-film transistor liquid crystal displays.